Gideros Studio IDE unusable on macOS Mojave 10.14.3 pls help! I was excited to start learning Gideros but it won't work properly on my Mac mini 2018 i5 32GB running macOS Mojave 10.14.3. I have connected it to a standard 1080p monitor via an external GPUs with radeon rx580 8GB. The IDE looks very wrong, no matter what theme I use in some places I see no text (like where I set bundle id stuff for iOS/android. Typing code sometimes gets very sluggish and has even behaved as if I was pressing backspace a few times in a row. Running the player sometimes freezes up the computer forcing me to reboot. Has anyone else encountered these problems and know how to solve them? Please let me know. edit: the forum thread that @hgy29 referred to did not apply in my case. Hi @TechBoxNorth - Sorry you're having troubles. I'm on a Mac and using Mojave, and while the latest Gideros Studio is definitely a bit sluggish, I believe in my case it's cause by the retina screen. When I drag the Gideros Studio window to a lower resolution monitor, it feels more responsive. I haven't had any crashes any other problems though. I'm wondering whether is a graphics driver or something along those lines, that might be causing the issue. Just for the sake of investigating I have tried with my external gpu set as boosting back to the internal gpu of the Mac mini and then with no egpu and it made no difference so now I'm back to running the graphics from the mini via the egpu to the monitor. Don't know if this info helps but like I said I have found a combination of theme settings that at least makes most of the text etc in the IDE visible so I can use it. I installed the Mojave on my Mac, latest version. I have no speed issues at all. @TechBoxNorth - Did you manage to get things working, or is it still acting funny? I wish I could help, but apart from the Gideros Editor being a little bit laggy on a Retina screen, everything works fine for me. @Ninjadoodle I think the lag was because I didn't completely understand how the Gideros Player works but now I know how to use it properly and it works fine. @antix Not all Macs have the same gpu so for sure there can be some differences but after some tweaking with the themes that is now also solved. id metalDrawable; > "No type or protocol named 'CAMetalDrawable"
seems like your iOS SDK is too old. Which version of XCode do you use ? Well exporting to my iPhone worked.. once! Now when I try again I get errors about application identifiers, keychain access and provisioning files. What is happening? I didn't change anything. Made a new iOS project in GameMaker Studio 2 and exported it and everything works fine but I'd rather use Gideros! Nope still same problem and I'm out of ideas. If anyone can help please let me know! Can you share your .gproj file ? Maybe there is something wrong in the project settings, like bad app id or version or whatever ? 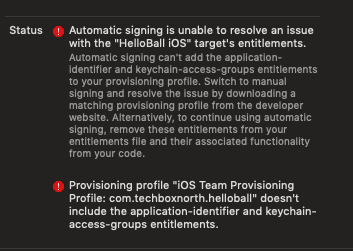 Well the signing works now but I can't run a project on my iPhone, I get an error that says that my phone has denied the launch request, haven't seen that before.. *sigh* will this never work? Weird thing is that after I have tried to launch the game on my phone from Xcode and get the denied msg, if I reboot the phone the game can be started like any other installed game.